in North Carolina. There are several crimes in North Carolina that constitute offenses against police officers or government officials. Two very common charges that we see frequently are resisting a public officer and assault on a government official. Both of these crimes are misdemeanors and oftentimes occur together or accompany other criminal charges in North Carolina. Resisting a public officer is the crime that most people are referring to when they say “resisting arrest”. This crime is usually more formally called “resisting, obstructing, or delaying a public officer.” It is governed by North Carolina General Statute 14-223. This encompasses many more offenses than just resisting arrest. It is punished as a Class 2 misdemeanor in North Carolina. If any person shall willfully and unlawfully resist, delay or obstruct a public officer in discharging or attempting to discharge a duty of his office, that person is guilty of this offense. We most commonly see clients charged with this offense when they did not follow police commands or when a police officer accuses them of putting up some sort of resistance during an arrest. It almost always accompanies another charge, such as trespass or assault, for example. This is because this crime is charged when someone is accused of interfering with a police officer carrying out his or her official duties. 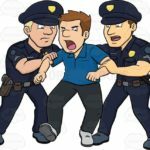 Typically, although not always, this occurs when the officer is investigating a crime that the defendant has been accused of committing or when the officer is attempting to place the defendant under arrest. This crime oftentimes accompanies resisting an officer. Assault on a government official is governed by North Carolina General Statute 14-33. It is punished as a Class A1 misdemeanor, which is the most serious level of misdemeanor in North Carolina. A person is guilty of this crime if he or she assaults an officer or employee of the State or any political subdivision of the State, when the officer or employee is discharging or attempting to discharge his official duties. If the defendant assaults a law enforcement officer and inflicts serious bodily injury on the officer, the crime becomes more serious and is punished as a Class F felony. For information on other forms of assault in North Carolina, check out our blog on felony assault crimes here and misdemeanor assault crimes here. If you have been charged with resisting arrest in North Carolina or assault on a government official in North Carolina, contact a criminal defense lawyer to discuss your options.